The 34.14 metre motor yacht Southern Star has been listed for sale by Bob Cury at RJC Yacht Sales. Built in GRP by US yard Westport to a design by Jack Sarin, Southern Star was delivered in 2006 as a Westport 112 model. Accommodation is for eight guests in four cabins comprising a master suite, VIP suite and two doubles. All guest cabins have updated audio/video systems throughout and en suite bathroom facilities while the crew quarters sleep four staff aboard this yacht for sale. On the teak aft deck, a high-gloss table rotates for seating eight guests in comfort and there is a walk-behind bar to port with a sink, refrigerator & ice maker. Three teak bar stools face a flush-mounted flatscreen 42-inch Sunbrite television set. A spacious flybridge has ample seating areas, a wet bar, barbecue, Jacuzzi tub with sun pads and a boat deck for the 15' Nautica tender. The main deck saloon offers two sofas, three lounge chairs, a coffee table and a games table with two chairs. A bar with a sink, refrigerator, icemaker, glass storage & liquor cabinet is to port aft while to starboard is a flatscreen television set with a storage cabinet. In June 2018, she received a complete Awlgrip exterior paint job along with bottom paint. Also in 2018, her interior was updated with new custom carpets, new appliances and Cambria stone countertops in the galley. Her top speed is 26 knots and her power comes from two 2,000hp MTU 16V2000M91 diesel engines. 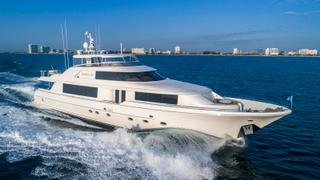 Lying in Fort Lauderdale, Florida, Southern Star is asking $5,595,000.